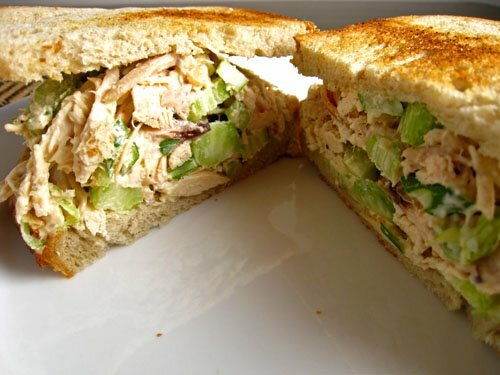 This is the best chicken salad sandwich recipe that we could find so I hope you enjoy it. It really is a tasty mixture so let us know how you get along with it. Bring a saucepan of water to the boil and then drop in the chicken. It should take about 20 minutes. Just make sure it is fully cooked before you go feeding it to your family. Shred the chicken into small strips and then put it into a bowl with some mayonaise, pepper, and a bit of salt. You want to use about 3/4 cup of mayonaise. Stir in the 1/2 the red onion, cheese, a pinch of garlic powder, sliced celery and the grated carrot. Now it may look like a bit of mess but trust me it is beautiful! Put it between some taosted bits of bread with some and be impressed!